Perhaps I ought to buy a tailless fastback. So goes the tail of the cat and the mouse. From me. I had been working—but no more. 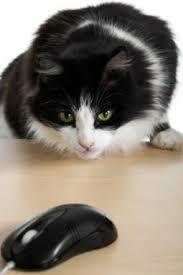 So swishes the tail of the cat and the mouse. Of text that slowly scrolls down the white page. So curls the tail of the cat and the mouse. And tracks the pad-bound motion of my mouse. Then jumbled text appears -- a real screen jinx. So twists the tail of the cat and the mouse. Demanding my attention, all at once. Leaps down with tailed pride from his catnap hour. So waves the tail of the cat and the mouse. Begrudging time I spend to clear the screen. While my obedient mouse sits, quite serene. The jungle tale, not tech, surely rules my hands. So ends the tail of the cat and the mouse.